If there is a path to the left, turn left. If score = 100, print "Well done!". 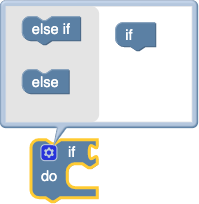 See additional information about conditional statements. When run, this will compare the value of the variable x to 100. If it is larger, "What a big number!" will be printed. Otherwise, nothing happens. As with the previous block, "What a big number!" will be printed if x > 100; otherwise, "That's not very big." will be printed. An if block may have zero or one else sections but not more than one. 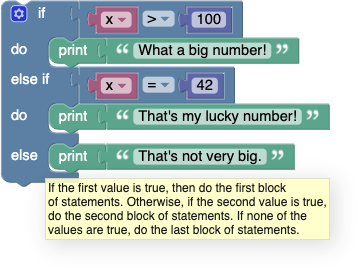 The block first checks if x > 100, printing "What a big number!" if it is. If it is not, it goes on to check if x = 42. If so, it prints "That's my lucky number." Otherwise, nothing happens. 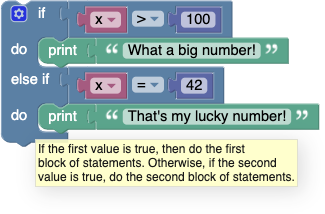 An if block may have any number of else if sections. Conditions are evaluated top to bottom until one is satisfied, or until no more conditions are left. The else section guarantees that some action is performed, even if none of the prior conditions are true. An else section may occur after any number of else if sections, including zero. Note that the shapes of the blocks allows any number of else if subblocks to be added but only up to one else block.